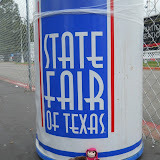 Yesterday the Baudelaire family spent the day at the great State Fair of Texas. It's the best fair in the world, and I say that with complete confidence, having been to one other state fair and zero fairs in other countries. It's that good. Also, I've lived in Texas a long time and have acquired the habit of boasting about things of which I have little knowledge. But really, it's that good. 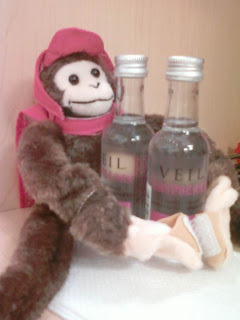 We were accompanied on our Fair Day by this blog's mascot and goodwill ambassador, Cornelius T. Monkey. Since I make a point of being anonymous here, Corny graciously consented to chronicle his day in photographs and share them with you. Enjoy the slideshow. I'm not gonna lie - I have to side with Precocious Daughter on this. I think Corny may have had more fun that ANYBODY at that fair, and I'm jealous. I'm not jealous because he had the most fun at the fair though; I hate fairs. They're overcrowded and full of idiots that make me want to punch them in the face. I'm jealous because your family let you take Corny with you! Mine wouldn't come anywhere near me if I did that. I'm going to make The Manchild read this.